I found my piggy Josie had passed away this morning. This was rather a surprise, given that her cagemate, Cappy, is very frail and less than two weeks ago I thought I was losing her, but she’s hanging in there. 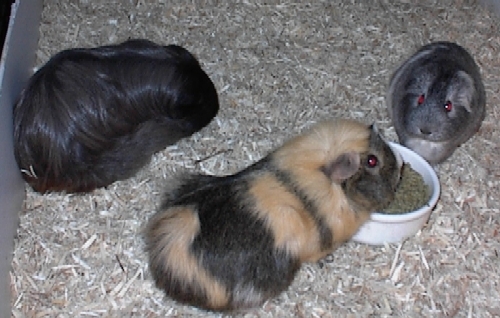 Both are quite old but Josie (aged six or seven) had been maintaining her weight and acting just fine, while Cappy has lost a LOT of weight, rattles when she breathes, falls over and cannot always right herself, and has progressive paralysis on her left side and difficulty eating. But Cappy’s still hanging out this morning! Josie just looked like she’d gone to sleep in the corner, and I didn’t hear any response from the other animals during the night so I don’t imagine it was a particularly loud/distressing event. Josie had surgery last October for ovarian cysts and duct growths, unidentified white spots all over the uterus, and cervical cancer, and my unfortunately extensive experience with piggy cancer has taught me that we usually get a year of quality life after such surgery (it seems to spread), but it’s worth it because they bounce back quickly and are happy and healthy in the interim. My best guess is that she may have had a cancer recurrence and the “maintained” weight may have been tumors. But who knows. I’m so happy that she had been acting fine and was not outwardly ill–it’s all about QOL. Josie lived with roomies Greta and Cappy for many years, just Cappy more recently as Greta left us awhile back, and had come from a guinea pig rescue in Illinois. Here she is after her surgery last year and with her pals. Now to figure out how to keep Cappy company. I will move her into a bit smaller cage and maybe I can put her next to the bunnies. I haven’t been down to a single pig in years. I’m so sorry about Josie. 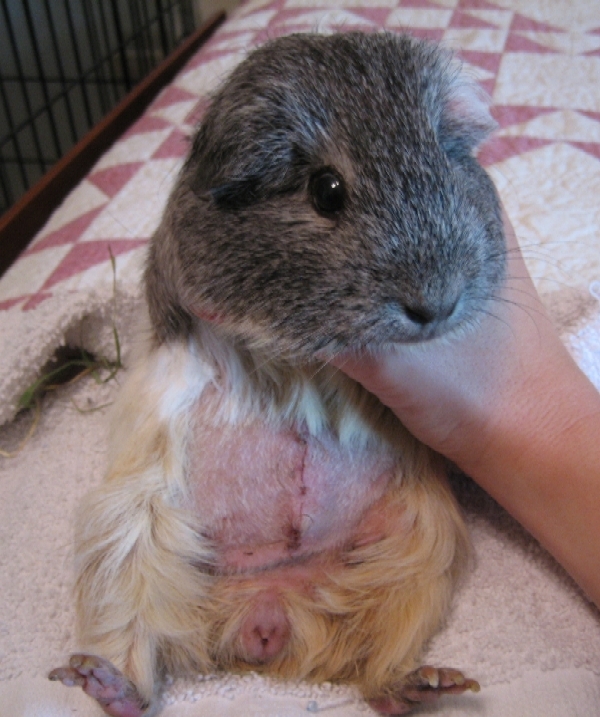 A guinea pig named Maggie was my first pet and it was so sad when she died. I’m sorry to hear about Josie, Amy. She was a sweetheart.